Why don’t you cover all important points of grammar? Other sites do this; mine is dedicated to errors in usage. This is not a site dealing with grammar in general. I’m learning English as a second language. Will this site help me improve my English? Very likely, though it’s really aimed at the most common errors of native speakers. The errors others make in English differ according to the characteristics of their first languages. Speakers of other languages tend to make some specific errors that are uncommon among native speakers, so you may also want to consult sites dealing specifically with English as a second language (see, for example, “Curricular Resources in English“). There is also an ESL On-Line Help Desk for students at Washington State University. An outstanding book you may want to order is Ann Raimes’ Keys for Writers. Aren’t some of these points awfully picky? This is a relative matter. One person’s gaffe is another’s peccadillo. Some common complaints about usage strike me as too persnickety, but I’m just discussing mistakes in English that happen to bother me. Feel free to create your own page listing your own pet peeves, but I welcome suggestions for additions to these pages. First, read the Commonly Made Suggestions page, and if you still want to write me, please do so, after reading the instructions on that page. You will find certain words or phrases criticized here listed in dictionaries. Note carefully labels like dial. (dialectal), nonstandard, and obsolete before assuming that the dictionary is endorsing them. The primary job of a dictionary is to track how people actually use language. Dictionaries differ among themselves on how much guidance to usage they provide; but the goal of a usage guide like this is substantially different: to protect you against patterns which are regarded by substantial numbers of well-educated people as nonstandard. Why do you discuss mainly American usage? Because I’m an American, my readers are mostly American, and American English is quickly becoming an international standard. I often take note of ways in which American English differs from standard British practice. However, the job is complicated by the fact that Canadians, Australians, and many others often follow patterns somewhere between the two. If the standard usage where you are differs from what is described here, tell me about it, and if I think it’s important to do so, I’ll note that fact. Meanwhile, just assume that this site is primarily about American English. If you write mainly about American English, why do you so often cite the Oxford English Dictionary? First of all, I do not write exclusively about American English. I address UK usage in many entries on this site. Second, the OED strives to cover both UK and US usage, and often notes words or expressions as having either originated in or being used mainly in the US. It is by no means an exclusively British dictionary. Third, the OED is the recognized authority among linguists for etymology. It’s not always the last word in explanations of word origins and history, but it is the first source to turn to. That’s the main purpose for which I use the OED. Fourth, because the OED tends to be more conservative than some popular American dictionaries, when it accepts a controversial usage, that’s worth noting. If even the OED regards a usage as accepted in modern English, then one should hesitate to argue that such usage is an error. But because the OED is so conservative, and doesn’t always note when a formerly obsolete word is revived or changes in usage, it’s not a perfect guide to contemporary usage. It is particularly weak in noting changes in spoken rather than written English. Does it oppress immigrants and subjugated minorities to insist on the use of standard English? Language standards can certainly be used for oppressive purposes, but most speakers and writers of all races and classes want to use language in a way that will impress others. The fact is that the world is full of teachers, employers, and other authorities who may penalize you for your nonstandard use of the English language. Feel free to denounce these people if you wish; but if you need their good opinion to get ahead, you’d be wise to learn standard English. Note that I often suggest differing usages as appropriate depending on the setting: spoken vs. written, informal vs. formal; slang is often highly appropriate. In fact, most of the errors discussed on this site are common in the writing of privileged middle-class Americans, and some are characteristic of people with advanced degrees and considerable intellectual attainments. However you come down on this issue, note that the great advantage of an open Web-based educational site like this is that it’s voluntary: take what you want and leave the rest. It’s interesting that I have received hundreds of messages from non-native speakers thanking me for these pages and none from such people complaining that my pages discriminate against them. But you made a mistake yourself! We all do, from time to time. If you think you’ve found an error in my own writing, first read the “Commonly Made Suggestions” page, then follow the instructions on that page if you still think I need correcting. I’ve changed many aspects of these pages in response to such mail; even if I disagree with you, I try to do so politely. If you write me, please don’t call me “Brian.” My given name is Paul. A few residents of the United Kingdom and Canada have taken umbrage at my statement that “American English is quickly becoming an international standard.” “Piffle,” they assert; “everyone knows that the Queen’s English is the worldwide standard,” or words to that effect. Let’s see if I can make this clear while being reasonably polite. First of all, note that I do not claim (though I could) that American English is the international standard, only that it is becoming a standard, alongside the older UK standard. Because so many people use it, it is important to understand its peculiarities. When most English speakers were part of the Empire—or later, of the Commonwealth—British patterns of spelling, punctuation, and usage prevailed. Now we live in a different world. Chinese from Hong Kong and Singapore speak with a British accent for good historical reasons, but enormous numbers of them from Taiwan and The People’s Republic study mostly American patterns. Arabs from the Middle East, Japanese, Russians, Central Asians of all sorts, and hosts of other people study much more often in American colleges than in British ones. When treaties are being negotiated, international statements issued, meetings translated, and films dubbed, the lingua franca is far more likely to be American English than UK standard. American television and movies have alone spread American accents throughout the world. This may be a deplorable fact, but it is a fact. Like many Americans, I warmly admire traditional English speech patterns and accents. This site in no way suggests that American ones are superior. They are simply more prevalent, in the world at large, and certainly on the Web. I am not an expert on UK usage. It is also worth noting that in a surprising number of cases, American pronunciation and usage are more conservative than that of the British. Some instances are noted on these pages in which US speakers preserve older patterns abandoned by speakers in the British Isles. My goal is to defend American standard usage from the bullying of non-American critics, and to warn Americans not to be parochial in assuming that everyone speaks like they do. For obvious reasons, careful writers have to pay attention to a relatively small number of differences, but we don’t have to let those differences whip us into a frenzy of mutual denunciation. A weekly discussion by Paul Brians and his editor Tom Sumner about language and other matters. 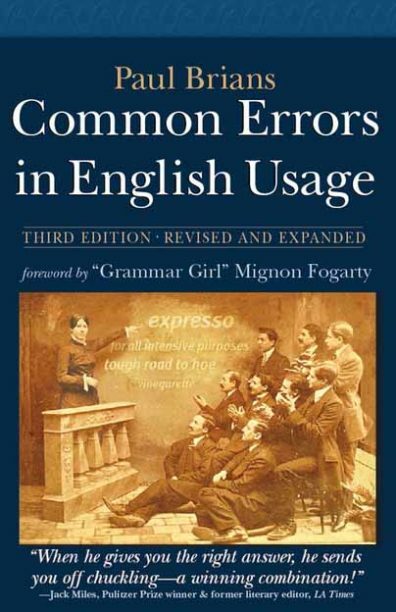 William, James Co. has published a book based on this site titled Common Errors in English Usage. It contains most of the contents of the Web version (as of the date of publication) plus more detailed discussion of many of the entries simply listed here under “More Errors.” Since the site will remain online for free use, why should you buy a copy? It’s more portable than the Web site. It contains amusing old engravings turned into illustrative cartoons. It’s arranged in straightforward alphabetical order with plenty of cross-references to make it easy to look things up. Supplementary category lists group together the titles of entries on various types of errors like commonly misheard words and expressions, foreign words, and redundancies. Depending on your printer, it may be cheaper ($19) than printing off the text version of the site from the Web would be. It makes an entertaining gift for somebody who could use a little unthreatening help, like a student setting off for college. You still have access to future entries here, as a supplement to the book. Read more about the book on the William, James site. Shipping within the US is free if you order here. Or phone 1-800-FBA-BOOK (1-800-322-2665 for those who dislike dialing letters). If you are a fan, you might consider asking your local bookstore or library to order the book. I’d call Paul Brians’ book incredible, fabulous, or fantastic, except thanks to him, I know now that none of those words are what I really mean. Let’s just say that Common Errors in English Usage is the most cheerfully useful book I’ve read since the Kama Sutra. I rarely take a Grammar Girl podcast live without at least quadruple-checking my main thesis, and Common Errors in English Usage has quickly become one of my most valued fact-checking resources. When the corners of this book are worn off, the spine is broken, and the fuzzy edges are spiked with Post-it notes marking your most used pages, don’t forget to write Brians a note of thanks. By distilling reams of rules and opinions into a usable, entertaining reference book, he’s made all our lives a little easier.